With Hyundai’s announcement yesterday that it’s the first automaker to make Android Auto available on a production vehicle, owners of Android devices will be able to access aspects of the mobile operating system such as music, mapping and messaging while behind the wheel. Android Auto is launching on 2015 Sonata models with navigation and is controlled through the car’s in-dash screen, steering-wheel controls and voice-recognition system. While Hyundai said that Android Auto eventually will be featured on most of the automaker’s vehicles and will be installed at the factory, owners of existing 2015 Sonatas with nav can add it via a software update free of charge by Hyundai dealers. The update takes about 45 minutes and can be performed during, say, an oil change or other routine maintenance, according to Miles Johnson, manager of Connected Care Publicity for Hyundai. Later this summer, owners will be able to download the update onto a USB memory drive via a Hyundai website and install it themselves. While Ford’s Sync system pioneered the concept of USB-based infotainment updates and Tesla raised the bar by issuing routine over-the-air software updates for its Model S to improve the car long after it left the showroom, Hyundai is the first to add a third-party infotainment platform like Android Auto this way. 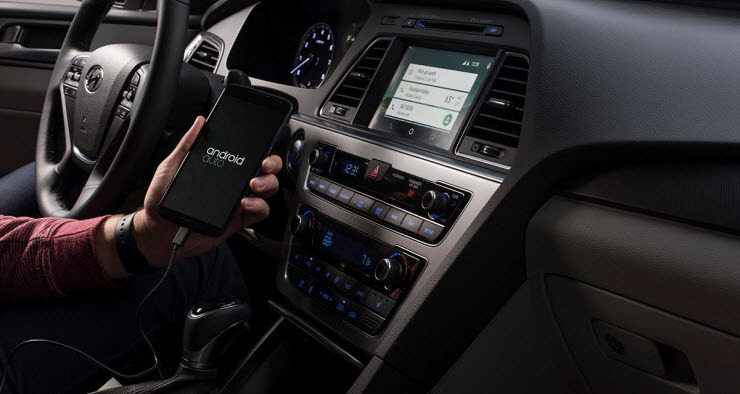 For Android Auto to work in the 2015 Sonata, a device needs Android’s 5.0 Lollipop operating system or later and an Android Auto companion app installed. The device also has to be connected via a micro USB cable to the car’s USB port, but can use Bluetooth for wireless data transfer. The first time an Android device is plugged into the Sonata’s USB port when the car is parked and after the Android Auto software has been installed, the owner will be prompted to download the companion app. Android Auto and Apple CarPlay, a similar device-integration platform for iOS, were announced more than a year ago. Both Google and Apple AAPL -0.47% said that the platforms would appear in cars by the end of 2014 but have run into road blocks that have delayed their introduction.